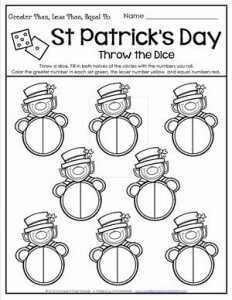 This St Patrick’s Day Throw the Dice worksheet was intended to have each child throw one dice, however, if you’d like them to use more than one that would be fine, too. Kid throw a one or more dice and write how many they rolled on one half of a circle. They roll again and write how many in another circle. In each circle they determine which number is greater and color that space green (for St Patty’s Day). The lesser number is colored yellow (to represent gold), and equal numbers red (just because).